Brian Gardner is an acclaimed professional speaker perfect for your next sales training, conference or digital roundtable. Brian Gardner has more than 25 years’ experience in sales management and CRM. 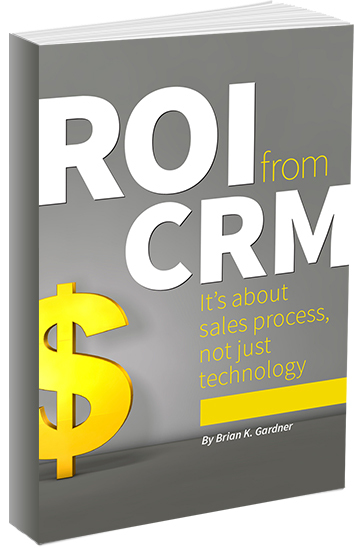 Founder of SalesProcess360, Brian is also the author of ROI from CRM. Learn more about Brian’s experience here and check out the testimonials, speaker profile and preview video on this page. Book Brian for your next event via the contact form at the bottom. >> Find out where Brian will be presenting next on the SalesProcess360 events calendar. Brian’s high-energy talks are designed to challenge audiences with practical discussions and interactive exercises. While customizing his presentation according to client preferences, Brian will outline the importance of a company’s sales processes, particularly the oft-neglected but critical “front end” of the sales cycle. His talk will focus on front-end sales management, quote management, sales KPIs, account profiling and business intelligence practices that help industrial distributors and manufacturers gain a competitive edge. To help audience members maximize ROI from CRM software investments, Brian will challenge attendees to evaluate and improve their own implementation and training processes and teach them to leverage CRM to identify and capitalize on low-hanging sales opportunities. Talks will emphasize that the power of CRM technology lies with the ability to design and automate sales processes that result in high customer satisfaction and ROI. >> For detailed speaker topic information, click here or on the image above to download a printable copy of Brian’s Professional Speaker Profile. A popular offering with associations, Brian’s sales- and CRM-focused roundtable sessions help our association partners strengthen their educational offerings at zero cost to them and with very minimal effort on their part. Member attendees submit questions in advance, and they discuss each topic as a group during the session. Brian pulls from 25 years’ experience in sales management and CRM to throw in his two cents, as well. Upon request, Brian will also provide a session highlights article for the association’s newsletter or blog, extending the educational value of this service to the association’s entire membership base. For full-screen viewing, click the play button then hit the full screen button at the bottom right.